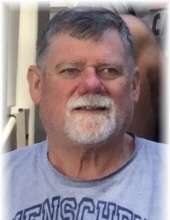 Douglas V. Henschen, age 64, of Frederic, MI passed away unexpectedly on Monday, November 5, 2018 at his home. Doug was born to Dallas and Joan (Mitchell) Henschen on February 18, 1954 in Findlay, OH. He was a 1972 graduate of Bowling Green High School. For most of his life Doug lived in or around Bowling Green, Ohio and had recently semi-retired, moving to Frederic, MI in March 2017. He was employed at SunFrog Shirts in Gaylord, MI. Doug was a life-long member of both the Eagles & Elks Clubs and enjoyed golfing, bowling, fishing, hunting, riding snowmobiles and loved spending quality time with his family, especially his grandchildren. Doug was an avid Detroit Tigers and OSU Buckeyes fan and rarely missed a chance to watch the games. Doug is survived by his daughter, Adrianne (Matt) VanAtta and two grandchildren, Wesley and Abby VanAtta, all of Findlay, OH. He is also survived by his brother, Gary (Linda) Henschen, and two sisters, Tina (David) Wallace and Jodi (Mark) O’Gara as well as five nephews, Aaron Henschen, Nathan (Heidi) Henschen, Alex Wallace, Andrew O’Gara & Nick O’Gara and two nieces, Andi (Tim) Fintel and Deanna (Marty) Dansack. He was preceded in death by his mother, Joan, father, Dallas, and brother & sister-in-law, Mike & Carolyn Henschen. Visitation will be held Friday November 9, 2018 from 4:00 to 8:00 p.m. at Dunn Funeral Home, located in the Historical District of Bowling Green at 408 West Wooster St. His funeral service will be held Saturday November 10, 2018 at 10:00 a.m. at the funeral home. Rev. Ernie Unholtz will officiate. Interment will follow at New Belleville Ridge Cemetery in Dowling, Ohio. Additional visitation will be held Saturday morning from 9:00 a.m. until the time of the service at 10:00 a.m.
Memorial contributions may be made to Adrianne VanAtta to assist with funeral expenses. To send flowers or a remembrance gift to the family of Douglas V. "Hooter" Henschen, please visit our Tribute Store. "Email Address" would like to share the life celebration of Douglas V. "Hooter" Henschen. Click on the "link" to go to share a favorite memory or leave a condolence message for the family.